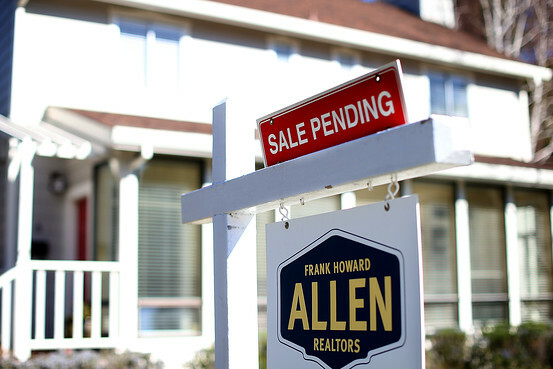 Seven years after the housing market began to collapse, rising prices and thinner inventories are presenting new opportunities for home sellers. Some hot markets are even seeing multiple offers for the same property—a phenomenon rarely seen since the boom years—as buyers become more confident and seek to take advantage of today’s near-record-low mortgage rates. Getty Images A home for sale this month in Larkspur, Calif.
“You will unambiguously see more people test the water,” says Thomas Lawler, an independent housing economist in Leesburg, Va. He expects home prices to rise another 3% this year. Thinking about selling? You are likely to find a buyer more quickly and at a better price if you factor in local market conditions and recent sales before setting an asking price, burnish your home’s Internet profile and plan ahead for a home appraisal. Acting soon may pay off as well. 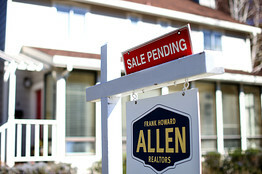 While trends vary by region, buyer search activity generally peaks in March and April, while seller listings peak in July, says Jed Kolko, chief economist at real-estate website Trulia.com. “Most sellers would be better off if they pushed the process up a couple of months,” he says. Don’t expect to make a killing. Even after the recent gains, home prices remain about 27% below their 2006 highs, according to CoreLogic. “The only reason I would sell today is if I wanted something more than I currently have,” says Craig Beggins, president of Century 21 Beggins Enterprises in Tampa Bay, Fla., where prices are still off more than 40% from their 2006 peak. 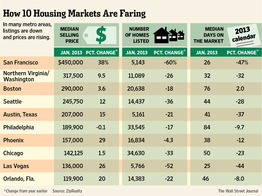 Houses are also selling faster. The median number of days on the market for homes in January was 71, according to the Realtors group, meaning half of all homes sold within that time. That’s down from 99 days one year ago. “I feel more confident, even if prices aren’t at the height they were six or seven years ago,” says Ms. Tolli, who has set a $1.2 million asking price for the five-bedroom waterfront property. That is more than it would have fetched a year or two ago, she says, but still well below its peak value of more than $2 million. 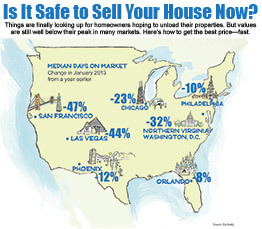 In markets such as Las Vegas, San Francisco, Los Angeles and Washington, D.C., “prices are up, competition is down, bank competition is down more, days on the market are shorter, and the prices being realized relative to the list price have really improved,” all good news for sellers, Mr. Baker says. But sellers shouldn’t be complacent. Here are some steps to consider. “I wanted to know whether they had sold any units in my building because it’s a specific market in the city, and whether they’ve represented the buyer or the seller,” she says. The broker Ms. Vaske chose has represented both sellers and buyers in her building, and “probably knows more details about the workings of this building than most residents do,” she says. Adjust your sights to today’s market. Set aside what you home might have fetched in 2006 and focus instead on what homes are selling for today. Dan Elsea, president of Real Estate One in Detroit, uses recent sales as his guide, paying particular attention to properties that have received multiple offers. He prefers the homes he sells to be among the five lowest-priced properties among similar homes. “Typically, a buyer will see and remember five homes at a time,” he explains. Don’t overreach. Given today’s thin inventories, it is tempting to reach for the stars. But if you get greedy and set the price too high, you are likely to wind up in a downward spiral. “You are going to have your largest viewing audience in your first days on the market, when the house is the newest product on the shelf,” says Lloyd Fox, a broker at Long Realty in Scottsdale, Ariz. If the price is too high, buyers and agents are likely to relegate your listing to the sidelines. Properly priced homes are likely to get eight to 10 showings their first week on the market and an offer soon after, Mr. Fox says. If not, “you have missed the market” and it’s likely a price cut is in order, he adds. For maximum impact, start with the photo “that is going to tell the best story of your home,” whether it’s the front view or a special feature, says Mr. Fox, the Scottsdale broker. Too many shots of a single room could bore buyers, he adds. For Kenneth Vaughan’s Phoenix home, Mr. Fox started with a photo of the home’s exterior to show its “curb appeal,” followed by photos of the living room, kitchen, backyard and master bedroom and bathroom. The home, which is selling for $119,900, received three full-priced offers in the first week, says Mr. Vaughan, a retired police officer. Clean up your act. Even in a market where inventories are thin, a home isn’t likely to sell if it looks shabby or crowded. At a minimum, you’ll need to touch up the paint, clean the carpet and pare your possessions. Julie Kaczor, a broker at Baird & Warner Real Estate in Chicago’s western suburbs, advises clients to get rid of magazine racks, statues, fireplace tools and anything else that can clutter up the edges of a room. She looks for inexpensive fixes with good payoffs, such as a fresh coat of paint, removing outdated window treatments or a carpet cleaning. Jan Baker, the home’s former owner, says the deal would have fallen through without the higher appraisal. “I would have had to have rented it again,” says Ms. Baker, a lawyer who purchased the home in 2005 for $136,900 and now lives in Midland, Texas.